Typhoon Haiyan hit the Philippines on November 8, 2013. 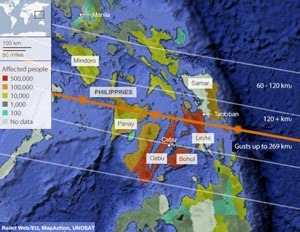 We watched its approach via the internet, fearing for the people of the Philippines as the super storm created 150 mile an hour plus winds and pushed huge waves towards the islands. 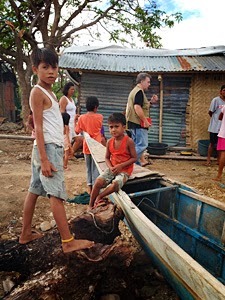 Unfortunately, although people were told to evacuate, many did not because they did not understand the severity of damage that this violent typhoon would bring. They did not know that the storm surge would send tsunami-sized waves crashing through the coastal communities destroying everything in their path. Many died and many more lost their homes and livelihoods as a result. On December 11, 2013, KIRF’s founder and President, Mark Kirwin, landed in Iloilo, on the island of Panay in the Philippines with fellow volunteer, Dr. Thomas Fiutak, to make an assessment of the typhoon disaster and provide relief to its victims. This island was directly in the path of Typhoon Haiyan and coastal communities on the windward side of the island suffered catastrophic damage. Mark is also a member of the Rotary Club of Ventura. Ventura Rotary’s financial assistance made this trip possible. 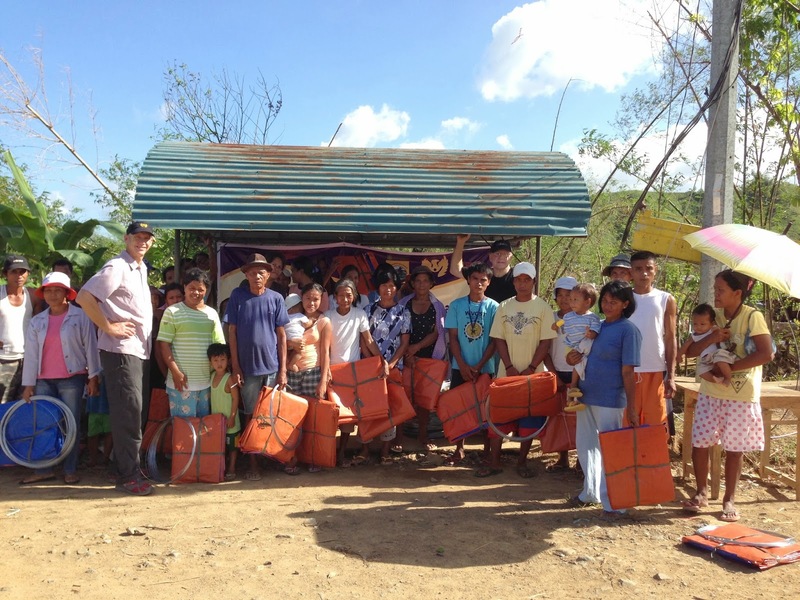 In addition, KIRF received aid from the Filipino community in Minnesota. We would not have been able to run such a effective relief trip without the invaluable assistance of Dr. Ted Robles, his wife Angel and other wonderful volunteers and alumni from the Central Philippine University (CPU) in Iloilo. With transportation and interpretation kindly provided by CPU, KIRF was able to assess damage and assistance needs for two communities in the Province of Iloilo, North Panay Island. 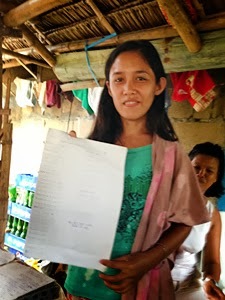 The first was the Barangay of San Diego in the municipality of Lemery. A “barangay” is the native Filipino term for village, district or ward. 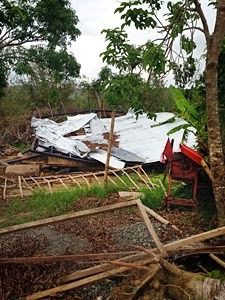 Although, this barangay was more inland from the storm, it suffered severe damage to the community’s houses, especially the roofs. The second area we assessed was the coastal community of Barangay Borongon, municipality of San Dionisio. This coastal village suffered catastrophic loss of most of its homes and fishing boats. Of the approximately 174 homes in the village, all were destroyed except for 30, which had significant damage. which also ruined coastal rice crops. 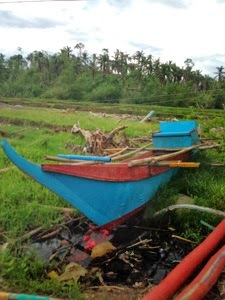 The village of Borongon also lost nearly of their fishing boats, which provided income for the community. The villagers thought that the storm surge would be like a normal typhoon but after the first wave they realized that the tsunami-size waves were over 20 feet tall and were obliterating their village. They then fled to the top of a nearby hill to watch their village destroyed and their fishing boats crushed or carried away by the storm. After assessing the two communities, we were advised that the most need we could provide was roofing materials for the houses. KIRF then worked with CPU and purchased sheet metal roofing, nails, sealant, tarps and wire and tools to assist with rebuilding the roofs of 226 family dwellings destroyed by the super storm. 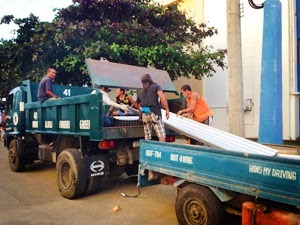 The city of Iloilo kindly donated a dump truck and driver to help KIRF deliver the aid to the villages with CPU. With the help of local volunteers we portioned out the building materials we purchased into individual packages for each home. With the volunteers’ help and the loan of the dump truck and driver we delivered and handed out the aid to the individual villagers on December 13, 2013. 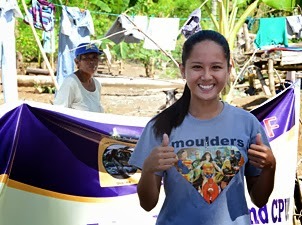 The people of barangay Borongon say "Thank you!" KIRF wishes to again thank CPU for all of its kindness and hospitality. 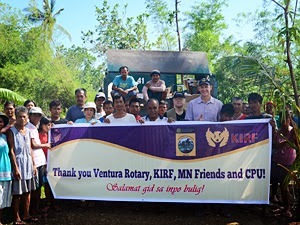 The Rotary Club of Ventura who’s partnership made it possible to provide as much relief as we did; and the Filipino’s in Minnesota who supported this trip financially and logistically; as well as all of the other KIRF donors who made this trip possible. barangays and local crop land with its tsunami-sized tidal surges. here. Near Lemery on the island of Panay, Philippines. 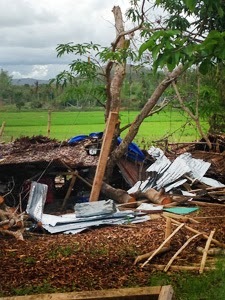 Typhoon Haiyan (Yolanda) on Panay Island. Typhoon Haiyan on the north east coast of Panay Island. 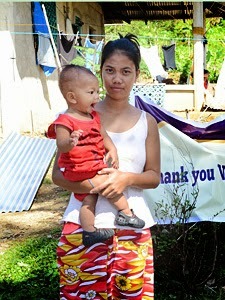 Families who got temporary roofs from KIRF in barangay San Diego. We wish we could of helped more families rebuild. 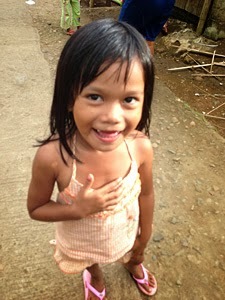 Happy baby, happy mama in barangay Borongon.